This is our friend Randi last weekend when she and John came to visit. 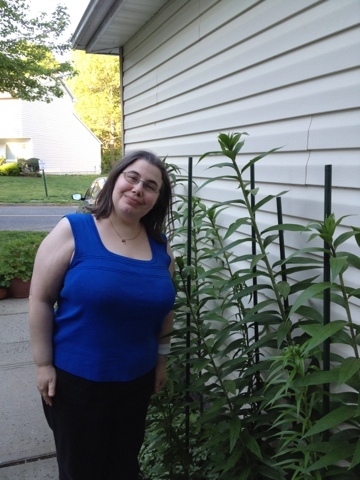 She is FAR from the shortest friend, and yet three of my lilies are already taller than her. At this rate they may reach John's 6'+ height! To tell the truth I have never seen such a gogreus flowers!! I love being at work and studying new information there and online essay writer custom essay writing service is the best in what he is doing. Your flowers are insanely beautiful! I don't know how you do this. All my flowers die immediately though I am doing everything in order not to kill them intentionally. This post tells me a lot! Three of your my lilies are already taller than you. It means that you do a lot of job and care of your flowers!